Although periodontal (gum) disease usually affects your gums first, your teeth may eventually suffer. That’s because the disease can damage both attaching gum tissues and supporting bone. One advanced sign of this is when one or more teeth become loose. A loose tooth is an alarm bell that you’re about to lose it. Fortunately, we can often treat loose diseased teeth with a two-phase approach. First and foremost, we need to bring the gum infection under control by removing plaque and calculus (tartar) — the “fuel” for the infection — from all tooth and gum surfaces. Depending on how extensive it is, we have options: we can use specially designed hand instruments to remove plaque and calculus, ultrasonic equipment that loosens and flushes plaque and calculus away, or, if necessary, conventional or laser surgery. Depending on the extent of the infection, in some cases we may need to use regenerative surgical techniques like gum and bone grafting to replace lost tissue. Healing takes time, though, which leads to the second phase of treatment — securing the loose tooth during gum healing. The most common way is through a bite adjustment, where teeth are altered to equilibrate chewing forces evenly. This results in all the teeth being hit at the same time allowing the loose teeth to heal and tighten up. Another option is splinting teeth together. Although there are different methods, the basic idea is to join the loose teeth with stable teeth like pickets in a fence. 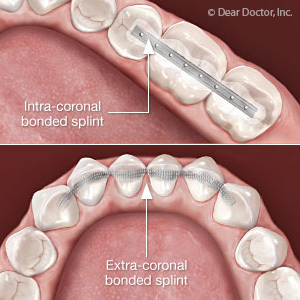 One way is to bond splinting material across the back surfaces of the involved teeth. Another way is to cut in a small channel across the teeth and insert and bond a rigid strip of metal to splint the teeth in place. The splint is usually a temporary measure while the gums heal. In some situations, though, we may need to perform a permanent splint by crowning the affected teeth and then splinting the crowns together. If you have a grinding habit we may also prescribe a night guard to limit the damage done while you sleep. Before deciding on which technique is best for you, we would first need to evaluate the health of the affected teeth to see whether the effort would be worth it. It could be the tooth’s supporting bone structure has become so deteriorated that it might be better to extract the tooth and consider an implant or other replacement. First, though, we would attempt if at all practical to save the tooth — and the sooner we begin treating it, the better your chances for such an outcome. Get Whiter, Straighter Teeth Without Crowns or Braces! How “tooth friendly” are your snacks? 6 QUESTIONS YOU SHOULD ASKâ€¦ BEFORE YOU CHOOSE YOUR NEXT DENTIST!